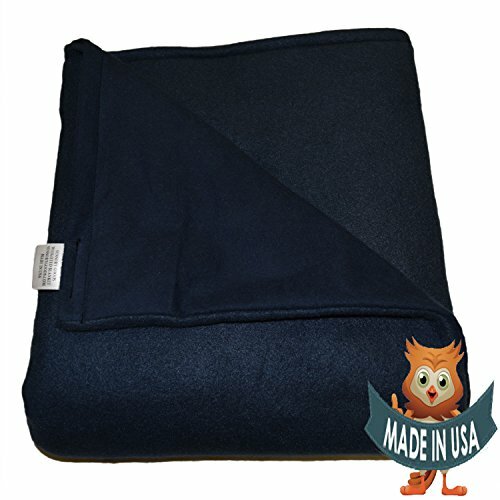 Young Adult Medium Weighted Blanket by Sensory Goods 13lb Heavy Pressure - Navy - Fleece/Flannel (41'' x 58''). Filled with tiny sand like glass beads evenly distributed throughout. Our blankets are made to order, with love, in the USA. 100% product satisfaction is guaranteed. Determine what kind of pressure you like-Do you pile several heavy blankets on yourself to achieve a level of comfort? If you are unsure, we recommend choosing a product with low pressure. If you think you need more, try a medium pressure blanket. If you have any questions about this product by SENSORY GOODS, contact us by completing and submitting the form below. If you are looking for a specif part number, please include it with your message.